EVANSTON, Ill. -- Northwestern University is continuing the development of its new Lakefront Athletics and Recreation Complex on Northwestern's Evanston campus. The University plans to file a permit request with the U.S. Army Corps of Engineers and work with the U.S. Fish and Wildlife Service, the Illinois Environmental Protection Agency, the Illinois Department of Natural Resources and other agencies in regard to construction of the building. In addition, renovation of the soccer/lacrosse and field hockey fields and construction of an outdoor football practice field will begin this spring. The complex will include a new fieldhouse that will provide a large, indoor multipurpose facility that will be used for football practice as well as other athletic team practices and competitions, recreational activities and non-sporting events. The new fieldhouse will be named Ryan Fieldhouse in honor of the leadership generosity of alumni Patrick G. and Shirley W. Ryan. The field located inside the fieldhouse will be named Wilson Field in honor of support from alumni Stephen R. and Susan K. Wilson. Additionally, the construction of a new outdoor football practice field and renovation of the soccer/lacrosse and field hockey fields will provide improved facilities for varsity sports, club sports and intramurals. The renovated soccer/lacrosse field will be named Lanny and Sharon Martin Stadium in honor of a campaign gift from alumnus J. Landis (Lanny) Martin and his wife, Sharon. Northwestern also has received a leadership gift from alumni Mark and Kimbra Walter, providing significant support for Northwestern Athletics and Recreation. Ryan Fieldhouse will be located adjacent to the existing Henry Crown Sports Pavilion/Norris Aquatics Center and Combe Tennis Center. The new facility will replace an existing structure, which houses three basketball courts and a running track, and a nearby outdoor parking lot. Ryan Fieldhouse, which will house a full-sized indoor athletic field that will enable Northwestern's student-athletes to practice and compete indoors during inclement weather. The fieldhouse will also be used for campus events, such as Dance Marathon. Portable seating for approximately 1,000 people with room for additional seats so the facility can be used as a site for University convocations and other events. Three basketball courts that will be used for intramural sports and recreational activities. Locker rooms for varsity sports teams. Sports performance areas with weights and exercise equipment. Renovation of the existing soccer/lacrosse and field hockey fields and construction of a new outdoor football practice field that would be used for varsity team practices, intramurals and other purposes. When construction is completed, all of Northwestern's football program activities, other than the games themselves, will be consolidated on the main campus, rather than on the athletic campus located at Central Street and Ashland Avenue, approximately a mile west of the main campus. 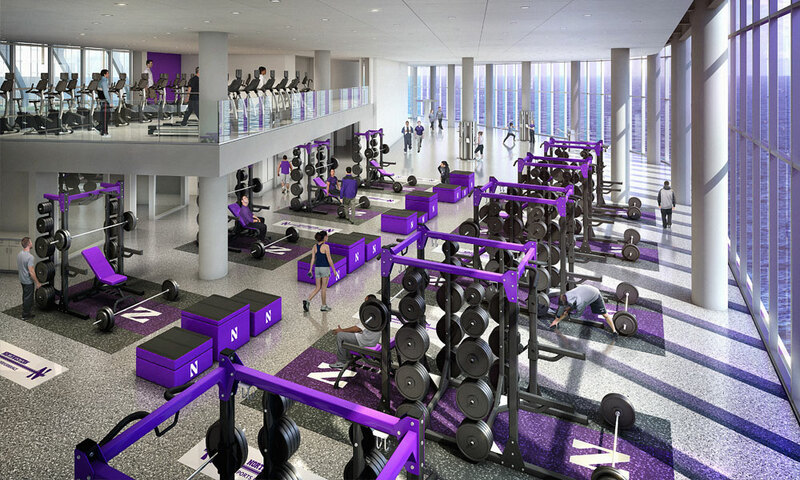 "We are thrilled to take the first steps on a truly transformational project for our Wildcats student-athletes and the entire Northwestern University community," said Jim Phillips, vice president for athletics and recreation. "This institution cultivates and expects excellence, and this complex will be second-to-none in allowing us to continue to provide a world-class experience." Construction will begin as soon as permits and approvals are secured. The University will work with the appropriate federal, state and city agencies, which will review the building plans, to ensure that the building meets all relevant regulatory requirements. Renovation of the soccer/lacrosse and field hockey fields and construction of the outdoor football practice field will begin this spring and is expected to be completed by spring 2016. Some portions of the project may be completed earlier. Northwestern will hold an informal information session on the complex from 7 p.m. to 8:30 p.m. on March 18, 2015 in Studio 2 on the first floor of the Henry Crown Sports Pavilion, 2311 Campus Dr. on Northwestern's Evanston campus. The information session is open to the public and free parking is available in the North Campus Parking Garage immediately adjacent to the Crown Sports Pavilion.